I am an unabashed horror fan. I've been writing professionally about film and videogames for over a decade; I've seen classic movies from decades ago as well as amazing foreign films that most mainstream cinemagoers will never witness; I've played every mainstream videogame release and most popular indie games for the past seven-odd years. Yet somehow I keep coming back to horror movies and games. I will prioritize them over other releases, regardless of the importance or popularity. And I'm not alone; most of the film critics I treasure share my love of horror, across the mediums. Yet at the same time, horror is treated as a lesser genre. This is unsurprising considering the utter crap that tends to rise to the top: this past week's garbage The Conjuring 2 will do amazing at the box office despite being as scary as a trip to McDonalds, and horror has all but faded away in the videogame mainstream, with the Dead Space series reduced to a poor action game before being permanently shelved. I don't know what the hell the last Resident Evil was, but it certainly wasn't scary (unless considered from the perspective of videogame craft and storytelling, where its total lack of quality is terrifying) and it's been well over a decade since the last great Silent Hill game. Fortunately, horror has found a niche in the indie videogame scene, where hits like Amnesia and Outlast have picked up the slack left by the Triple A publishers and done their own twists on the genre to deliver some pretty terrifying experiences. And then there's the astonishing phenomenon Five Nights at Freddy's, a game that isn't so much an experience as a Jump Scare Simulator. It might sound like I'm condescendingly declaring the series to be the videogame equivalent of The Conjuring 2, which at least initially wasn't an unfair assessment. The first game was a simple affair involving looking at security monitors at various dilapitated Chuck E. Cheese rip-offs, for fear of one bursting into the room to attack you. (Think of it as "Weeping Angels: The Game.") It wouldn't have been particularly difficult to program but became a massive hit, spawning legions of imitators and becoming its own series, where it rose in artistic status, creating its own mythology and an ongoing narrative that I'd argue is pretty interesting. A better comparison might be that the Five Nights at Freddy's games are more like the Goosebumps of this generation: they're aimed at kids while rooted in a classic style of horror without entering truly nightmarish or disturbing territory. They're safe and fun and, despite evoking a particular atmosphere and tension, are not going to permanently disturb anyone. Their stories are goofy, over-the-top tales of malfunctioning animatronics that accidentally bite the heads off children, or crazed serial killers who stuff the bodies of their victims into animatronic suits that come to life to take revenge. They're the sort of thing you'd imagine kids telling each other around a campfire, and in that regard they're a lot of fun. The fact that the actual storylines are deeply hidden within minigames in each FNAF game, and are open to interpretation, adds to the fun, as each are heavily discussed on Reddit and elsewhere. These games aren't complex, and neither is their lore, but it's interesting enough to discuss and look into and thus has developed a cult following. I find it much more fun to read about than to actually play. And thus we roll back to these toys. FNAF is so popular that it seems crazy that someone wouldn't have jumped on toys until now, but such is the way of the internet: marketing departments tend to step back and make sure the latest fad isn't something like Snakes on a Plane, instead ensuring it has actual fans and staying power before investing money in the merch. I honestly never thought we'd see action figures of these guys. So I was thrilled to bits to see Funko step up to the plate, following the successes of their Funko Legacy line. Fazbear Entertainment is not responsible for damage to property or person. Upon discovering that damage or death has occurred, a missing person report will be filed within 90 days, or as soon as property and premises have been thoroughly cleaned and bleached, and the carpets have been replaced. 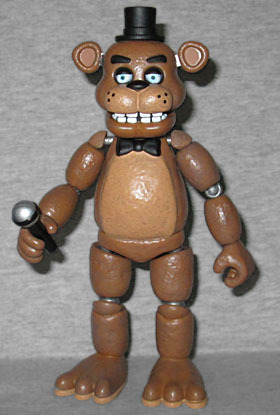 The leader of the animatronics and their band is Freddy Fazbear, the fluffy singer and bear member of the troupe. Far from the scariest in the game, Freddy is instantly recognizable as the game's icon (and his name is in the title!) and so he's the first one we're going to cover here. Funko's sculpt, while instantly recognizable, so somewhat soft - a part of this is due to the limited paint apps, but comparing the toy closely to the CG model there is a lot of detail here that is absent. This is partially because we're not dealing with huge toys here (these just are modestly priced [~$12] 5" figures after all), but all of the main elements are captured. I'm particularly fond of the way his eyes are depicted here, for example. But the minor details that fans obsess over (like the bloody handprint on his face) are sadly missed. Things get a lot more problematic when we get into the toy's articulation. Now, I know a lot of collectors aren't so fond of the type of joints frequently used by Japanese toys, where joints can be taken to pieces pulling pegs out like Revoltech, but the sheer number of action figures I've had break in their package makes me favor these very durable joints over most. 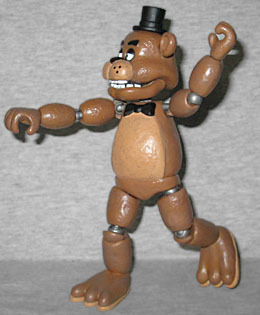 Freddy Fazbear features a strange variation on this, where most of the joints use balljoints that pop into place in such a way that movement is restricted, and worse, they will often fall out of their own accord. This is infrequent, but annoying, and mostly confined to the elbows and knees for some reason. I am of two minds about this; on the one hand, this avoids problems with joints breaking as seen all too often with toys nowadays, but the design here just isn't quite up to scratch. 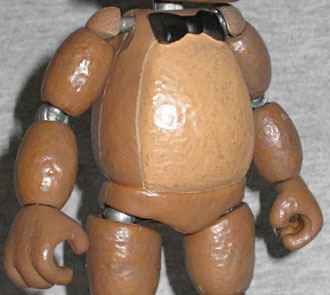 Using pliers can tighten these joints some, but the movement is restricted; it's a little difficult getting Freddy's microphone up to his mouth. That leads into the bigger problem with this figure, and indeed all of these figures. They have a good amount of articulation overall - find movement at the shoulders, elbows, wrists, neck, legs, knees and more - but arguably the most important joint is completely absent: the mouth. There is no jaw articulation here. Why is that important, you ask? Because that's the way that these goofy animatronics go from, well, goofy animatronics, to horrible murdering monsters. When they burst into the security room, it is mouth open, screeching, teeth bared, ready to kill. Having Freddy permanently stuck with his mouth closed means you're basically only getting him as a funny old bear rather than a killing machine, and something to fear. Does this make him a bad figure? No, not really. But this is a limitation that shouldn't have been overlooked. If you pose him lurching at another toy, he's only ever going to be lurching, rather than going for the kill. 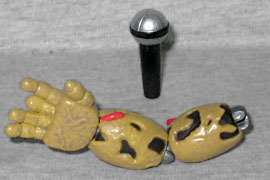 Freddy comes with two accessories: one, his microphone, which he can hold and nearly get up to his mouth, and the other is part of the series' build-a-figure Spring Trap. Now, I like that we get a bonus figure in this series, and Spring Trap is the only animatronic here not featured in the first game so it makes sense that he'd be a bonus in this first series, but that still feels a little short-changed here. The obvious missing feature is that Freddy's hat is permanently stuck on, whereas one might have liked to have seen it held on with a magnet like in the heyday of Palisades. This would have elevated the cost, to be sure, but Freddy looks mighty lonely in his package. Without the articulated jaw, maybe an interchangeable screaming head might have been nice? So, overall, where do I fall on this figure? I like him a lot, despite the major shortcomings. 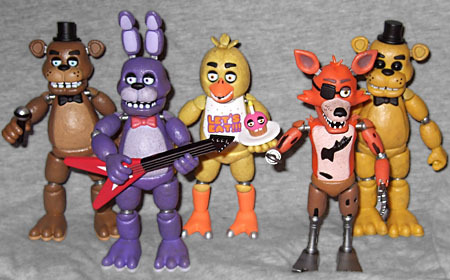 I've had all of these guys displayed in my house for a few days as a band, and they look great - but specifically as the Freddy Fazbear Band. The fact that I can't have Freddy attacking does put the value down, and I don't think it would have been difficult to do differently. It even looks as if the jaw was sculpted separately. Is it possible that having to sculpt/paint viscera inside the jaws stopped them from being able to do this with "kid-friendly" action figures? Or was it just a budget thing? Or did no one even consider this? Either way, it is something of a letdown, and you should consider this before you buy.